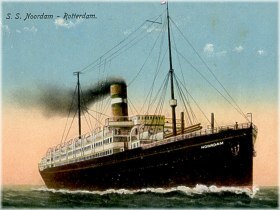 Peter Bos boarded the “Noordam” in Rotterdam, Holland, around September 27, 1906, and traveled to the United States of America. The “Noordam” was a Steam Ship of 12,528 gross tons, one funnel, 2 masts, and a speed of 15 knots. It had been making the voyage from Rotterdam to New York since 1902. Peter was born as Pieter on 3 November 1878 around 18:00 in Amerongen, Utrecht, The Netherlands. His parents were shopkeeper Antonie Bos (1848-1900), and his wife Evertje van de Grift (1850-1898). They were married on 24 July 1874 in Amerongen. Peter also had an elder brother Steven Bos (1875-1943) who remained in Amerongen throughout his life. Peter Bos was married on 13 Oct. 1904 in Rijsenburg near Zeist, Utrecht, to Sara Catharina Rutgers. She was born on 30 Sept. 1880 in Ellecom, Gelderland, The Netherlands. Her parents were carpenter Gerrit Jan Rutgers and his wife Frederica Sebina Delfos. Their eldest child, a daughter Johanna Frederika Sebina Bos, was born on 28 July 1905 in Rijsenburg. Peter Bos applied for a passport in September 1919. He had blue eyes, a straight and narrow nose, a small mouth, and a small and pointed chin. He had light brown hair and was wearing a moustache. His stature was 5 feet, 9½ inches (176½ cm). The application also mentions another daughter, Nellie Bos. She was born at Pierre, South Dakota, on 29 Oct. 1914. N.B. Bos is a very common surname in The Netherlands, and this Peter Bos is not related to me - as far as I know, but he is a namesake of my brother. Sources: United States Passport Applications 1795-1925, WieWasWie.nl, Family Search Civil Registration, Noordam History, Stamboom Zegert-Vis.